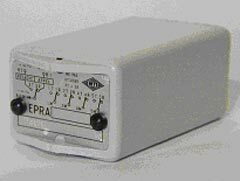 Latching relay with magnetic hold function and electric unlocking - 4 CO contacts - 7 A.
Relay pluggable on sockets including a withdrawal clasp and two guide pins.
. EPRA relay with specific characteristics (voltage, current, frequency).